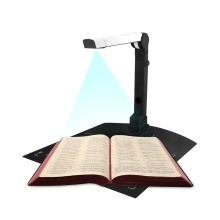 This portable document scanner with 5 mega-pixel camera achieves High Speed HD Scanning, supporting continuous scanning and video recording, is highly recommended for school and office. Secondary development supported without any charge. Switchable A4/ B5/ A5 scanning size meets most of the needs. HD Scanning: 5 Mega-pixel, plus automatic light supplement function, can clearly scan files and even material objects. No shadow, no dark corner, high qualified images. Quick Scanning: Just click the mouse, then you can get the picture in about 1 second. Continuous Scanning: Choose the continuous shooting function and set the frequency, easily finish a great deal of scanning work. One-key Word Recognition: Quickly export files in Word, Txt, PDF or other formats. Video Recording: Supports multiple formats of shooting, high utility and wide application area. Fold-able & Portable: Considerate structure, compact size. Easily taken anywhere. USB Connection: High speed transmission. No need of external power source. Install the driver before using.